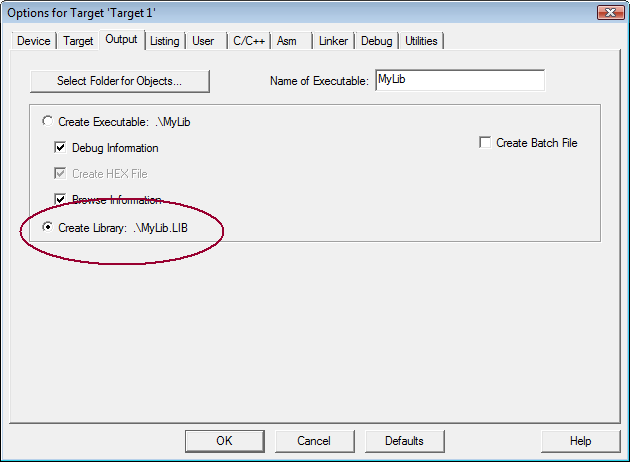 Enable Create Library in the dialog Options for Target — Output. µVision calls the Library Manager instead of the Linker/Locater. Since the code in the library will not be linked and located, the entries in the tabs Linker and Target are ignored. Build the project. Once the library file has been created, it can be used in projects the same way as you add source files to a project. By default, µVision loads only those library modules that are necessary for the application. In some rare cases it might be required to always include library modules. When you build a library using Software Components, you might need to set the flag Include in library in the dialog Options for Component - Properties to include source files and libraries used by the Software Component. If the library should be used for different devices, select a CPU listed under Generic in the Device Database.